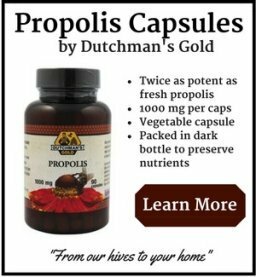 Explore the most comprehensive collection of propolis health benefits in the world. The number of ways in which bee propolis can benefit your health is quite astonishing (as you'll see by the list I've compiled below). 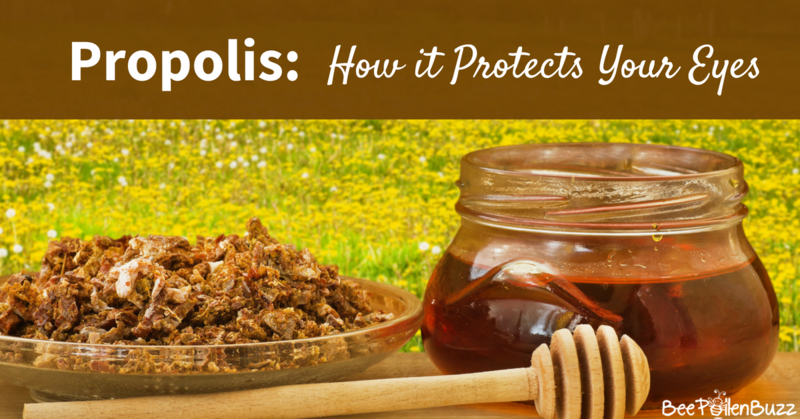 Did you know that propolis was sometimes called Russian Penicillin? It was found in every First Aid kit (and likely still is) in the Eastern European Countries where they did not have access to pharmaceutical drugs. It can be used for a variety of common applications and is ultra safe to take. 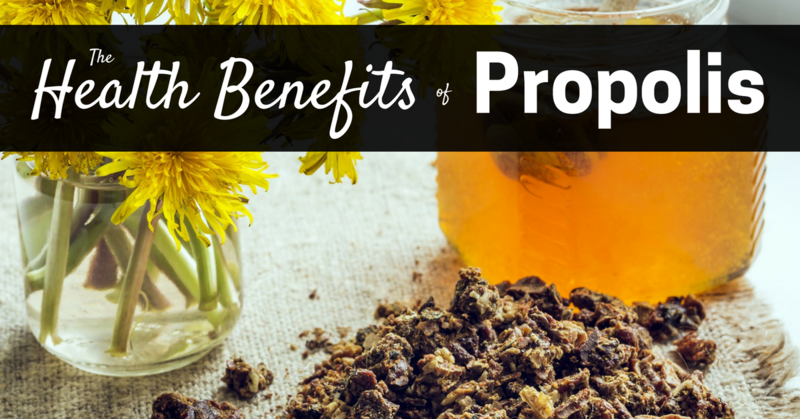 Below is a very comprehensive list of the many benefits of propolis. Click on any benefit below for further reading. I recommend that you remember the term 'AGEs'. It stands for Advanced Glycation End Products. AGEs can affect nearly every type of cell and molecule in your body and are a key factor in aging and in diseases like diabetes, heart disease, kidney failure and now Alzheimers Disease. They are formed by cooking foods at high temperatures. They also form in the body as a consequence of having excess sugars in the body. Modern diets are largely heat-processed and high in refined sugar. As a result, they contain high levels of AGE's. AGEs speed up the oxidative damage to your cells and alter their normal behavior. They make you age faster. Compounds that have been found to inhibit AGE formation include Vitamin C, benfotiamine, pyridoxamine, alpha-lipoic acid, taurine, aspirin, carnosine and the diabetes drug metformin. We can now add Propolis to that list. As reported in the Journal of Agricultural Food Chemistry, scientists set out to measure the anti-oxidant and anti-AGE potential of propolis. As an anti-oxidant superstar, propolis was thought to have huge potential when it came to AGEs. Propolis didn't disappoint - it exhibited 'very good' anti-AGE activities. The compound pinobanksin-3-acetate (found in propolis) was found to be responsible for the bulk of the anti-AGE effects of propolis. To limit the AGEs in your body and the risk of aging prematurely, I recommend using propolis several times throughout the day (in tincture or capsule form) along with Vitamin C and an aspirin. Also take a high quality multi-vitamin and mineral supplement for additional anti-oxidants. Avoid excessive high heat cooking of your food, particularly meats, and try to steam or poach your food as often as possible. Eat as many raw foods as you can, like fresh fruits and vegetables as they won't contain any AGEs. Lastly, avoid processed and refined foods as much as you can. Leaky gut is a term you're likely to become more familiar with in the near future. We're learning that more and more health conditions are linked to the health of your gut, or in the case of leaky gut, what passes from your gut into your blood when it shouldn't. Leaky gut occurs as a result of increased intestinal permeability or intestinal hyperpermeability. This happens when tight junctions in the gut, which control what passes through the lining of the small intestine, don't work properly. This lets substances leak into the bloodstream causing a host of health issues. Researchers investigated the effects of polyphenol-rich propolis on intestinal barrier function in human intestinal cells, as well as in rats. What they found was that the Propolis treated cells showed increased expression of the 'tight junctions'. Tight junctions are the closely associated areas of two cells whose membranes join together forming a virtually impermeable barrier to fluid. The tighter your junctions, the better. Less 'stuff' that isn't supposed to pass through the gut wall gets through, leading to fewer health issues. It is known that the compounds Quercetin and Kaempferol both promote intestinal barrier integrity and they are both commonly found in Propolis. It is likely that these two substances played a role in the ability of Propolis to improve gut health. In the animal study, the rats were injected with 100 mg/kg of Propolis extract. I don't recommend you inject Propolis but this does give us a starting point with regards to dosing. This dose would equate to a 150 lb human ingesting 6.8 grams per day which is on the high end but still reasonable. As a psoriasis sufferer, are you tired of the itchy, scaley, red patches on your skin? What about the burning irritation and constant scratching? Fed up with the revolving door of corticosteroids that your Doctor has put you on? If so, there might be a new kid on the block when it comes to safe, natural and effective treatments for Psoriasis. A recent study published in the journal Fitoterapia indicates that topically applied Propolis improves the lesions commonly seen with psoriasis and reduces the inflammation (red, irritated skin) that accompanies it. And it does it all without side effects or toxicity. Doctors used chemical irritants to create psoriasis like lesions on their test subjects and then used thermal imaging to monitor how effective propolis was at treating the condition. They found that when applied topically, an alcohol based propolis tincture reduced the damage to the skin while also reducing the overall inflammation. Less inflammation typically means less itching and scratching and relief for you. The study didn't indicate how often the propolis was applied but based on my experience using propolis topically, twice daily is a good place to start. I'd also recommend using a quality cream or salve instead of pure propolis tincture as it is quite messy and resinous, meaning it doesn't 'rub' into the skin very easily (its sticky). I use and recommend Beauty and the Bee's Nature's Salve with Propolis or the So Ho Mish Miracle cream, both of which have propolis in them. Ear infections are one of the most common diseases in children, especially in the cooler winter months. If you are a parent, I'm sure you've dealt with one or more ear infections in your children at some time during their youth. You might even be dealing with one right now! More than 75 percent of children may experience at least one infection of the ear before reaching 3-years-old. Adults are also prone to ear infections, though this condition typically occurs in younger children. Recent research on what causes ear infections has focused on air pollution. Chronic exposure to particulate air pollution is associated with the impairment of middle ear function. If you're a regular visitor to Bee Pollen Buzz, you know that Caffeic acid phenethyl ester (CAPE) is the superstar component of propolis and the compound that is garnering the majority of the attention from the scientific community. CAPE seems to be the compound in propolis that 'does most of the work' so to speak as it possesses strong anti-oxidant and anti-inflammatory capabilities. The aim of this September 2013 study was to evaluate whether CAPE could inhibit the inflammation caused by diesel exhaust particles. Could propolis potentially be an effective preventative for ear infections? The answer appears to be 'yes.' In the study, CAPE inhibited the inflammatory process that typically results from pollutants in the inner ear, a process that often leads to an ear infection. The researchers noted that a greater effect was achieved when propolis was administer BEFORE the pollution exposure, indicating that it just might be an effective preventative. What can you take away from this? As I often suggest, propolis appears to be both an effective natural anti-biotic AND an equally effective preventative. One might consider using it as part of an immune boosting program to help prevent those pesky colds that make the rounds every winter. I keep a Propolis throat spray and a tincture in my medicine cabinet year round. 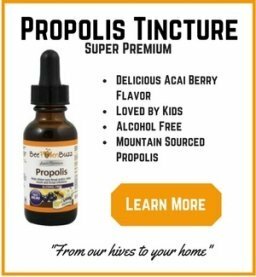 A water based propolis tincture is very handy for kids, especially one that tastes good. The full study can be found in The Annals of otology, rhinology, and laryngology, 2013 Sep;122(9):595-600. Scientists recently set out to investigate whether there was any synergistic effect of combining an anti-cancer drug with propolis in order to extend survival times. Propolis has shown very powerful anti-cancer activity in recent studies so the question of whether using the two together might create a even stronger effect was definitely worth investigating. Scientists gave the drug Irinotecan along with both Water Based Propolis and Alcohol Based Propolis to mice. The mice were given the equivalent of about seven grams of propolis per day for a 150 lb human for three days, which is a reasonable amount. Theoretically, a human could take this amount of propolis in a day. During the study, the researchers measured white blood cell count and other immune related parameters. They also measured how much damage was being done to the organs of the mice and their DNA by the toxic cancer drug. In a study where it was expected that all of the text subjects would likely die by the end of the study, the combination of the drug and propolis caused three of the nine to survive the full length of the study. Survival was increased in all of the subjects by a range of 7.53% to 231.54%. The combined treatment also significantly decreased the percentage of tumor cells in the abdominal region as compared to the mice that received no treatment. So what, if anything, does this mean for you? 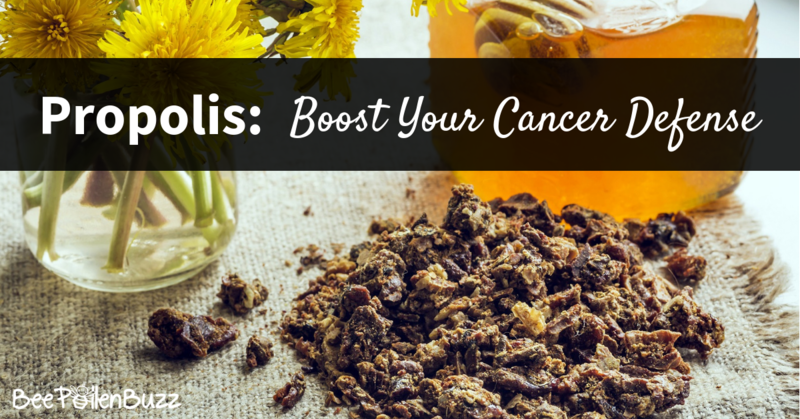 If you are undergoing cancer treatment, it might be worth speaking to your Doctors about adding propolis to your protocol. From a prevention standpoint, the evidence that propolis has a place as a preventative is becoming overwhelming. I take 1 - 2 grams per day for general health and cancer prevention. 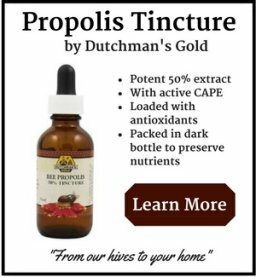 It just so happens that propolis has dozens of other health benefits that I obtain at the same time - propolis truly is one of nature's most versatile substances. The full study can be found in the journal Cancer Biotherapy and Radiopharmaceuticals, 2014 Jan 2. 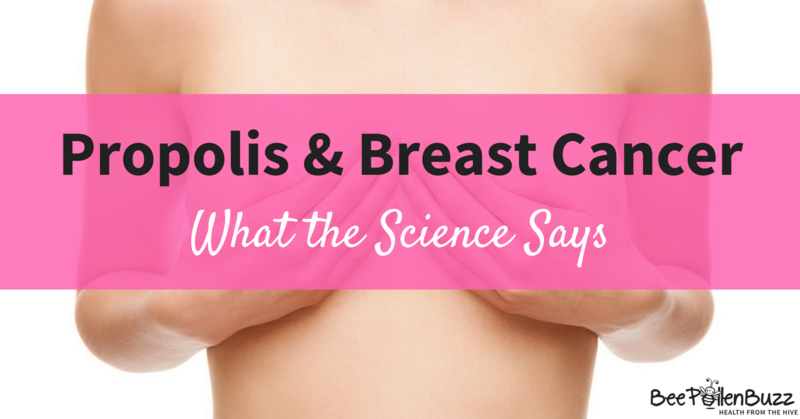 A study was recently published in the American Journal of Biochemistry and Biotechnology demonstrating propolis' effect on breast cancer cells. This study was performed in a human breast carcinoma cell called MCF-7. The results demonstrated that an extract of propolis can indeed induce cell death in breast cancer cells. In just 24 hours the propolis extract was able to kill 13% of the cancer cells. In another study published in the journal Oxidative Medicine and Cellular Longevity (Volume 2016), the Propolis compound Caffeic Acid Phenethyl Ester (CAPE) was found to augment the effects of the widely used drug Tamoxifen. Although Tamoxifen is one of the most widely used drugs in managing breast cancer, many women still relapse after long-term therapy. Scientists hoped to find a way to decrease the toxicity of Tamoxifen while increasing the effectiveness against MCF-7 cells. In the study, MCF-7 cells were treated with different concentrations of Tamoxifen and/or CAPE for 48 hours. This novel combination exerted synergistic 'cell killing' effects against the breast cancer cells, primarily via induction of apoptosis. Apoptosis is programmed cell death. The CAPE/Tamoxifen combo also decreased Vascular Endothelial Growth Factor levels which are a signal protein produced by cells that stimulate vasculogenesis and angiogenesis, both of which promote growth of the cancerous cells. In other studies, propolis has been shown to kill prostate cancer and colon cancer cells. Researchers found that it caused the cancer cells to die by necrosis, which means that it interrupted the blood supply to the cell and caused just the local cancer cells to die while not harming healthy, living cells. Cyclophosphamide is a common chemotherapy used for the treatment of several types of cancer. Unfortunately, it induces severe toxicity and side effects due to its oxidative stress capability (it kills ALL cells, not just the cancerous ones). We've all seen cancer patients with no hair, pale complexion and suffering from extreme nausea, among the many other terrible side effects of chemo. Scientists recently set out to investigate if Propolis could minimize these toxic side effects in cancer patients. Propolis has strong anti-oxident and free radical scavenging properties and the idea is that it might minimize the number of 'healthy' cells killed by the chemotherapy and thereby minimize the side effects of this nasty drug. Propolis could possibly act as a 'protector' of our healthy, non-cancerous cells while the chemo drug moves in and kills off the cancerous cells. The study was done in mice who were injected with either just the chemo drug or with Propolis AND the chemo drug in combination. The amount of propolis injected was 100 mg per kg. This would equate to 6.8 grams of propolis in a 150 lb human.As expected, the mice that received just the chemo drug showed an increase in the six metrics that were monitored to indicate oxidative stress (side effects result from this stress). It was also noted that dramatic physical changes to the liver and kidneys occurred. On the contrary, the mice that were injected with the chemo/propolis combination showed an improvement in the six parameters that were measured. Moreover, the health of the liver and kidneys was significantly better in these mice versus the 'chemo only' mice. The full study can be found in the journal Pharm Biol, 2014 Oct 7:1-7. This study was carried out to investigate the antibacterial activity of propolis. Two types of propolis were tested and both showed antibacterial activity against MRSA. This is the first report that shows antibacterial activity of propolis against standard and resistant strains of E. coli and MRSA. You can find this study in the September 6th, 2010 issue of the African Journal of Biotechnology.September, 2010. A recent study published in the journal Pharmaceutical Biology evaluated the wound healing potential of propolis. Wounds were created in rats which were then treated with a propolis ointment for a period of 14 days. Control rats were treated with vasoline. Topical application of propolis ointment for 14 days significantly improved the wound contraction when compared to the control group of rats. The scientists went on to say that "propolis possesses significant pro-healing activity by accelerating the healing process at various phases of tissue repair. The presence of biologically active ingredients such as flavonoids, phenolic acids, terpenes, benzoic acids, amino acids and vitamins in propolis may readily account for the observed prophylactic action of propolis in wound healing." Who would have thought that bee propolis benefits the healing of wounds? The bees have truly given us a remarkable substance to help keep us healthy! 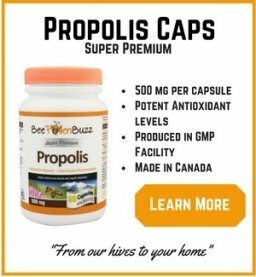 "I have purchased pollen and propolis from your site and must say, I tell everyone about the marvelous benefits of propolis. I have started administering pollen and propolis daily and I believe that I have benefited from it. Now, you want to hear something quite remarkable? Listen to this little story about my best friend: She is suffering from an incurable disease (HIV) and every so often she gets an outbreak of a lesion here and there. I told her about the benefits of propolis so one day, she came to my house and gave her a little chunk to use on her lesion. She would take a little piece of the propolis, soften it with fingers and apply it to a Band-Aid and then apply to the lesion, leaving it there and refreshing with a new Band-Aid each day. Within 2 days, the lesion had closed up and within 2 more days, the lesion had healed and was virtually gone. That was enough to make her a believe and she has since purchased product from your company. How amazing is this? Cataracts are the most common cause of vision loss in people over age 40 and is the principal cause of blindness in the world. Today, cataracts affect more than 22 million Americans age 40 and older. And as the U.S. population ages, more than 30 million Americans are expected to have cataracts by the year 2020. A cataract is a clouding of the eye's lens. When we look at something, light rays travel into our eye through the pupil and are focused through the lens onto the retina, a layer of light-sensitive cells at the back of the eye. The lens must be clear in order to focus light properly onto the retina. If it's not, we can't see or our vision is cloudy. This study investigated the effects of propolis on the progression of cataracts in rats. The researchers fed the rats high doses of sugar to induce cataracts, so remember that the next time you ask for a second serving of dessert. The study also looked at the effects of propolis on rat eye cells and how high doses of sugar caused them to age or 'oxidize' and die. Rats were fed either 0.1mg/kg or 0.6mg/kg of propolis per day for 4 weeks. This equates to only 7 mg or 42 mgs of propolis in a 154 lb (70 kg) person and are very small amounts of propolis. For example, a common propolis supplement would contain 500 - 1000 mgs of propolis. What they found was that ingesting propolis orally significantly inhibited the onset and progression of cataracts in 15% and 25% of the sugar fed rats. The rat eye cells exposed to high levels of sugar showed a significant increase in Reactive Oxygen Species (ROS) levels and reduced function. The sugar caused oxidative stress, which in turn lead to damage to the cells. In humans, this leads to dysfunction, disease and aging. Treatment of these cells with propolis significantly reduced the oxidation levels and increased cell viability, indicating that the antioxidant activity of propolis protected cells against ROS-induced damage. I would suggest that had the rat's been given higher doses of propolis, something in the range of 500 mg per day, results would have been stronger yet. The full study can be found in the Journal of Ophthalmology 2016;2016:1917093. The purpose of this study was to examine the effects of propolis on fracture healing. Could it speed up the rate at which our bones heal? Obviously, if it can this would be of benefit to the millions of us who break bones each year. It would also highly benefit our senior population who experience increased levels of fractures as they age. Thirty-two rats with femur fractures were divided into groups that either received nothing or propolis for three or six weeks. What the scientists found was that the bone mineral density was higher in the rats that received propolis. They also found that these rats had higher antioxidant levels - superoxide dismutase and total glutathione, than those that didn't receive the propolis. These two anti-oxidants are the two most important antioxidants in the body! They also found that the propolis boosted bone mineral density over time meaning the longer they took it, the more bone density they built. So if you've suffered a fracture or are concerned about your bone density, consider adding propolis into your daily supplement protocol. I take one to two grams per day. The full study can be viewed in Phytotherapy Research, March 21, 2011. Propolis continues to show tremendous activity against different types of cancer cells in study after study. This most recent study was designed to evaluate the antitumour properties of propolis on several different types of cancer cells in mice. What the scientists found was that propolis inhibited the proliferation of the cancer cells and caused apoptosis - a type of cell death in which the cell uses specialized cellular machinery to kill itself. The authors also noted that propolis caused the cancerous cells to rupture (swell up) and die, which is obviously a very good thing. What is very encouraging when it comes to using propolis for cancer in humans is that the experiments in the tumor-bearing mice were done with oral administration of propolis at doses that caused no detectable toxicity. So massive doses that would not be tolerated by humans were not needed and it was not required to inject the propolis. Nor was it toxic in any way in the doses that were administered. This would suggest that propolis may be able to kill cancer cells in humans in relatively small doses that one could take by pill or powder. While there is no conclusive study on exactly how much propolis to take to maximize your cancer defenses, the overall body of research is beginning to show that daily doses of 2 - 5 grams are likely to be effective for prevention in humans. These scientists went on to state that this study provides the rationale to investigate the potential beneficial effect of propolis in the diet of patients receiving anti-cancer therapies. The full study can be found in the journal Food Chemistry & Toxicology, 2012 Jan 28. Scientists recently set out to study the antioxidant effect of both water and alcohol based propolis on the liver and kidneys of diabetic mice. Essentially, they wanted to determine if propolis could protect these organs from the oxidation (which results in cellular damage) caused by diabetes. Trust me - you don't want your liver and kidneys oxidizing any faster than they currently are! The researchers also examined whether the two extracts of propolis could prevent diabetic nephropathy (this is a progressive kidney disease which leads to dialysis) and liver toxicity. What they measured in the study was how long the mice survived along with body weight levels and liver and kidney stress markers. The results were very, very impressive. The administration of propolis to diabetic mice resulted in a significant increase in body weight as well as improved blood and immune levels. All of the mice with diabetes showed increased levels of stress in the liver and kidneys. However, the mice treated with propolis extract resulted in significantly lower levels of free radical damage to these key organs. The scientists aren't 100% sure but suggested that the amazing anti-oxidant power of propolis is what protected the kidneys and livers of these mice. While they didn't say that propolis would do the same in humans, they certainly suggested that there is hope. Propolis has been well established as having the ability to boost and balance the immune system. The use of propolis for arthritis is now being investigated, or more specifically whether it can reduce the severity of rheumatoid arthritis. Using an alcohol based propolis tincture, scientists evaluated how the propolis effected the mechanism by which the disease is caused in mice. To do this, they examined something called Interleukin-17. Interleukin-17 has numerous immune regulatory functions and the numbers of IL-17 producing cells in the mice fed propolis were significantly decreased. This indicates there was less inflammation in the joints of the mice as a result of the propolis - the propolis suppressed their immune systems or helped to better regulate them. The scientists also found that mice fed propolis exhibited significantly lower clinical arthritis scores than those fed the control diet. The doses given to the mice were not stated in this study so in order to determine how much a human would need to take for rheumatoid arthritis is difficult to hypothesize. Based on the amounts that I use and see to be effective for other conditions, I would suggest that one would need several grams of propolis per day to see some relief from arthritis. One could obtain this dose from a three to five 1000 mg propolis capsules per day. Again, just my opinion but it will be interesting to see some further research on this topic in the future. The full study can be found in the journal Inflammopharmacology, 2011 Aug 23. Studies indicate that propolis has activity against breast cancer cells, prostate, colon and pancreatic cancer cells. Skin cancer can now be added to that list. In this most recent study reported in the Brazilan journal Acta Cirurgica Brasileira, Propolis was given orally in concentrations of 10, 50 and 100 mg/kg to modulate skin cancer cells that were induced by the application of a nasty chemical called 9,10-dimetil-1,2-benzatraceno. The compounds identified in propolis that these scientists were most interested for their anti-cancer properties were catechin, epicatechin and formononetin. Treatment at 100 mg/kg (about 6.8 grams for a 150 lb person) resulted in significantly decreased tumor growth and multiplication throughout the five weeks of the study. This concentration also resulted in the highest frequency of non-invasive tumours. The number of malignant or cancerous tumours was also significantly lower in this group. This research only adds to the astonishing list of bee propolis benefits that already exist. While the study wasn't done in humans, the fact that it was done in animals and also consumed orally in a dose that is quite reasonable to take on a daily basis is very encouraging. Propolis is well known for containing a substance called CAPE. CAPE has been shown in dozens of studies to have anti-cancer, anti-inflammatory, anti-viral and anti-bacterial properties, among others. Now there is a new kid on the block called Cinnamic Acid. Cinnamic acid is also showing anti-oxidant and anti-cancer activity, which is wonderful for the readers of Bee Pollen Buzz as many of you already consume propolis regularly. In this study, researchers set out to examine three 'cousin' substances of Cinnamic Acid - Artepilin C, Baccharin and Drupanin and how they acted against colon cancer cells. 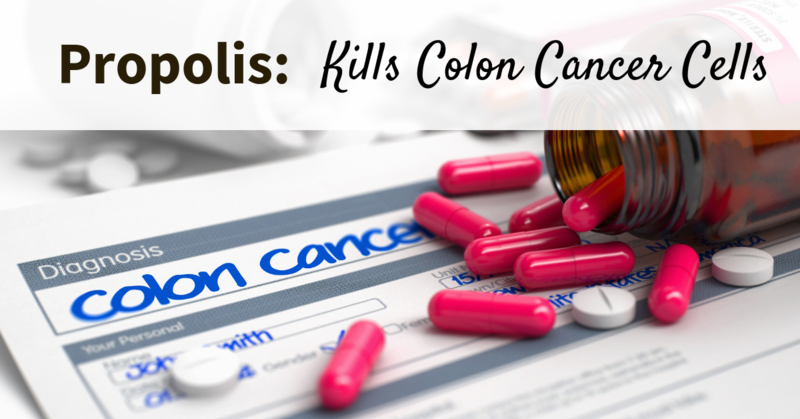 Colon cancer is a big problem today and alternative treatments are badly needed. In 2014 about 136,830 people are predicted to be diagnosed with colorectal cancer in the US, and about 50,310 people are predicted to die of the disease. In both men and women, colorectal cancer is the third most commonly diagnosed cancer and the third leading cause of cancer death. The researchers found that these three compounds had a potent ability to induce apoptosis. Apoptosis is 'programmed cell death' which means the cancer cells die off instead of replicating. What is even more promising is the fact that these Cinnamic Acid compounds had this effect on drug-resistant colon cancer cells. Drug resistant cells are those which usually remain after chemotherapy and simply do not respond to drugs. With increased exposure to the drug (for example, rounds two and three of chemotherapy), these cells become even more resistant. It appears, based on this study, that Propolis has an ability to 'turn off' this resistance by altering gene expression of the cancer cells. While this study suggests that supplementing with propolis has enormous significance with respect to cancer prevention, more research is required to determine exactly what doses are required. In the meantime, I'll continue to take my propolis each and every day! The full study can be found in the journal Phytomedicine, Volume 21, Issues 8–9, July–August 2014, Pages 1070–1077. One of the leading causes of death as we age is weakened immunity. Sure, we get cancer or pneumonia or the flu more frequently as we age but these conditions result from a compromised or weakened immune system. If we can figure out how to maintain the strength of the immune system longer, then fewer deaths will result. A recent study in the Journal of Clinical Biochemistry set out to look at whether our 'bee friends' can help give our immune system a much needed boost as we age. What they did was feed some 'old' mice different doses of green propolis for 4 weeks. They then monitored several different immune parameters to see how they responded. One of the main immune benefits they found was that Propolis dramatically increased IgG levels. IgG's are antibodies and are major components of the immune system. By binding to many kinds of pathogens (viruses, bacteria, and fungi) IgG protects the body from infection. What is exciting to see is that this effect was found at the lowest levels of propolis supplementation in the study - 83.3 and 157.4 mg/kg of body weight. Ingesting 83 mg's of propolis per kilogram would be the equivalent of a 150 lb person taking 5.6 grams per day. While on the high end, this is still reasonable for a human to ingest daily, if not for a short period of time. For example, if one was coming down with a cold or flu OR if they had already contracted it, taking 5 grams a day for 5 days is very reasonable. I often take 3 grams or more per day if I get sick until the cold is gone and while this study was done in animals, I'll be experimenting with higher doses if I contract a virus or bacteria.